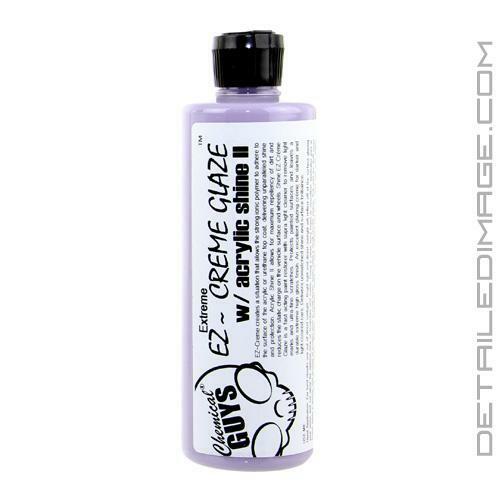 Chemical Guys discontinued the EZ Creme Glaze and recommends you upgrade to the Black Light or White Light. Both formulas are premium glazes that help clean the paint, hide imperfections, and add incredible amounts of gloss while protecting the finish. After just one application you'll be blown away by the by the depth of the gloss these products can add. The Black Light is designed to work on darker finishes like black, blue, green, purple, red, and steel grey, while the White Light is ideal for white, silver, light grey, yellow, and tan. You can easily apply it by hand with a foam applicator or apply it by a buffer with a nice soft pad. With either option you will love the results and want to use this again and again! The EZ Creme Glaze with Acrylic Shine II is a great way to quickly add lots of shine back to your paint. With just one application you will add dramatic depth and gloss that makes the paint look very deep. Apply the EZ Creme Glaze by hand or with a buffer and you'll instantly notice how it helps fill in imperfections and provide a more uniform appearance to the clear coat. This special formula helps fill in and ultra fine swirls, so they are not visible to the naked eye. The shine left behind is quite remarkable and gives you an unbelievable amount of gloss that really grabs the light for maximum reflection. The polymers included in this formula helps you get a longer lasting shine which differentiates this formula from other glazes. The versatility and impressive results make it extremely valuable for any detailer to have. Use it after applying polishes and before applying a sealant or wax. No matter where you use the EZ Creme Glaze in your routine you are sure to add more shine with this easy to use formula. EZ-Creme creates a situation that allows the strong ionic polymer to adhere to the surface of the acrylic or urethane top coat, delivering unparalleled shine and protection. Acrylic Shine II allows for maximum repellency of dirt and reduces the static charge on the vehicle surface and wheels. Shine EZ Creme Glaze is a fast acting paint restorer with supra light cleaner to remove light marks and ultra-fine scratches. Protects painted surfaces and leaves a durable extreme high gloss finish. An excellent glazing creme for darker and light colored cars. Delivers unmatched shine and surface brilliance. " Hand Application: For best results use out of direct sunlight. Bright light and direct sunlight will reflect off of the surface glaring your vision and not allow for optimal view of scratches and swirls. Using a clean terry towel or microfiber applicator pad or towel, apply a quarter size amount of product work in small areas; apply using a small circular motion. Rub until dry. Buff away excess product. Repeat as necessary. Machine Application: Select the best polishing pad to be used with your buffer. (Preferably a new or clean one) Apply enough glaze to work 2'(foot) by 2'(foot) area. Apply polish to affected area using light to medium even pressure. Read nice results easy easy easy, like in the old days similar to Liquid Ebony without using the buffer. Great shine; easy on - easy off. Makes my Jet Black 1 Series glow. I agree with all the great comments about this product. It works extremely well. Reasonably priced. Excellent results. The smell alone makes it a pleasure to use. It glides on and wipes off easily. Try it, you'll like like it !